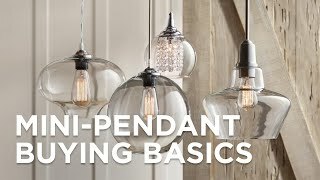 The glass shade that covers this steel mini pendant is transparent to offer a look at its lone light bulb. An oiled-bronze finish boasts modern elegance on the frame of this steel mini pendant by Kichler. Its clear glass shade boasts antique personality with eye-catching ribbing. Help to illuminate your favorite decor through the bold presence of this compact pendant. 10 3/4" high x 5 3/4" wide. Round canopy is 4 3/4" wide. Weighs 3.3 lbs. Oiled bronze finish over steel frame. BEST ANSWER: The maximum overall height measures 114 inches. Is this rod or cord hung? Is it adjustable? BEST ANSWER: This suspends by adjustable cord.